Atheneum/Caitlyn Dlouhy Books, 9781534404458, 320pp. In the tradition of Jason Reynolds and Matt de la Peña, this heartbreaking, no-holds-barred debut novel told from three points of view explores how difficult it is to make it in life when you—your life, brown lives—don’t matter. Juan has plans. He’s going to get out of El Paso, Texas, on a basketball scholarship and make something of himself—or at least find something better than his mom Fabi’s cruddy apartment, her string of loser boyfriends, and a dead dad. Basketball is going to be his ticket out, his ticket up. He just needs to make it happen. His best friend JD has plans, too. He’s going to be a filmmaker one day, like Quinten Tarantino or Guillermo del Toro (NOT Steven Spielberg). He’s got a camera and he’s got passion—what else could he need? Like Juan’s run-in with the police, like a sprained ankle, and a tanking math grade that will likely ruin his chance at a scholarship. Like JD causing the implosion of his family. Like letters from a man named Mando on death row. Like finding out this man could be the father your mother said was dead. Like his characters, Matt Mendez grew up in central El Paso, Texas. He received an MFA from the University of Arizona and is the author of the short story collection Twitching Heart. He lives with his wife and two daughters in Tucson, Arizona. 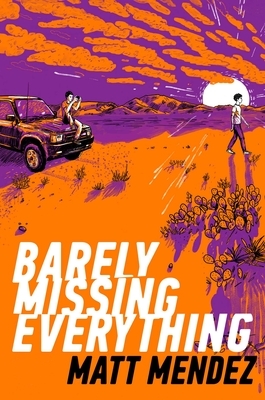 Barely Missing Everything is his debut young adult novel. You can visit him at MattMendez.com. At once accessible and artful, this is an important book about Mexican teens holding onto hope and friendship. This searing portrait of two Mexican-American families conveys the experiences of a group that is underrepresented in YA fiction. Mendez minces no words as he presents issues that are all too real for many Latin American communities. . . . Mendez's attention to raw detail in plot and diction is both painful and illuminating. With its shades of social justice, this will appeal to readers of Matt de la Peña and Jason Reynolds. For fans of Matt de la Peña’s Mexican Whiteboy.